Checkout these Fasciatherapy specialists...hardly gets better than this! Duluth Birth & Baby Fair is tomorrow. Hope to see you there! Another of our wise and courageous elders has passed on. Author and anthropologist Sheila Kitzinger - who wrote more than 25 books on childbirth - has died at her Oxfordshire home at the age of 86. I would highly recommend this class for anyone interested in how to help balance structure during pregnancy for better positioning and easier births. Welcome Breech Balancing! In this class you will learn easy to use techniques to help create space to invite your baby to turn head down. Please bring a partner, spouse, or friend. We will be meeting at Sunu Wellness in Minnetonka, MN. It is located behind Ridgedale just off of Hwy 394. Participants will learn a variety of techniques to encourage a baby to find their best position. 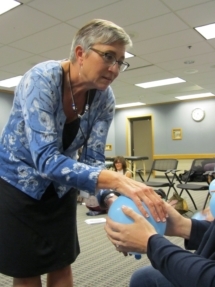 Families will learn movement, massage, and review a few Spinning Babies techniques to create balance in the soft tissue, creating space in the abdomen and pelvis, so baby may find their best position. The importance of taking these techniques home and continuing to do them at home will be emphasized. We will have a great time moving, bonding with the babes, and learning to work with our body. Chances for baby to find their way into better positions will increase, but is not guaranteed. This will primarily be a hands-on class. Bring your partner or good friend.